With the Donald Trump shutdown finally over—at least for now—Democrats in the House of Representatives moved quickly to start work on their top legislative priority, House Resolution-1, a sweeping package of democratic reforms with broad popular appeal: voting rights protection, campaign finance reform and government ethics, brought together by Rep. John Sarbanes from Maryland. “Our best friend in this debate is the public,” Speaker Nancy Pelosi said when Democrats first unveiled the proposal on Nov. 30. The public got its first close-up look on Jan. 29, with the hearing before the House Judiciary Committee. 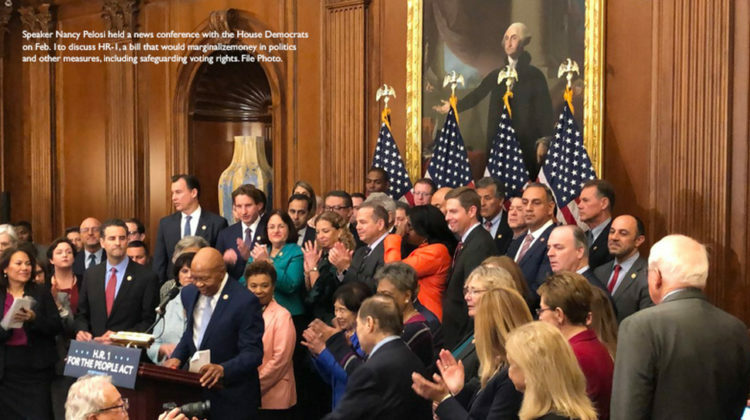 The committee heard from a panel of experts, including Sherrilyn Ifill, president of the NAACP Legal Defense and Educational Fund, and Vanita Gupta, president of The Leadership Conference on Civil and Human Rights. Since their founding in 1940 and 1950 respectively, both organizations have played a leading role in expanding and securing voting rights. They also heard from two GOP-invited panelists who are prominent promoters of the widespread voter fraud myth that Republicans have used to justify rolling back voting rights, despite the embarrassing lack of evidence. Both testified to a wide range of voter suppression problems which have proliferated since the Supreme Court struck down part of the Voting Rights Act in 2013. Meanwhile, on the Senate floor, Majority Leader Mitch McConnell called the bill a one-sided power grab [that] may pass the House, but not the Senate. But his baseless, bombastic response only underscored the fundamental problem: The Senate majority he leads is based on just 44.2 percent of the popular vote in the last three Senate elections, while the Democrats’ House majority represents 53.4 percent of the popular vote the past November. While HR-1 wouldn’t change the structure of the Senate to make it more representative, it would significantly reduce other restrictions hampering American democracy, making it easier for more people to vote, giving them more voice in the electoral process, and more confidence in the government they elect. Specifically, regarding voting rights, HR-1 would modernize America’s voter-registration system by bringing automatic voter registration, provide same-day voter registration and online voter registration to voters across the country. It enhances ballot access via 15 days of early voting and makes election day a national holiday. It ends gerrymandering by establishing state-level independent redistricting commissions, restores voting rights to criminals not imprisoned for a felony, and restores the Voting Rights Act. Many states have already implemented some or even most of these ideas, but the national picture is extremely uneven. As for campaign-finance reform, HR-1 provides a voluntary six to one match for federal candidates raising money from small donors. It also requires Super PACs and “dark money” groups to make their donors public, and requires Facebook and Twitter to disclose the sources and amounts of money spent on political ads on their platforms. Regarding ethics, HR-1 would require presidents to disclose their tax returns, prevent congressional members from using taxpayer money to settle sexual harassment cases or buy first-class plane tickets and create a new ethical code for the U.S. Supreme Court. The day after the hearing, McConnell charged that HR-1 was “a package of urgent measures to rewrite the rules of American politics for the exclusive benefit of the Democratic Party.” But most of what’s in it is either commonplace in democracies around the world, popular with voters, or matters of common sense. Election day is a weekend event in the vast majority of countries, and the U.S. is alone in letting politician’s choose their voters by drawing district lines. This past November, a number of states continued the process of popularly adopting parts of HR-1. Colorado, Michigan, Missouri and Utah all voted to put redistricting in non-partisan hands, in different ways — by landslide majorities in all but Utah. Florida re-franchised convicted felons with 65 percent of the vote. Maryland established election-day voter registration with 67 percent. Nevada approved automatic voter registration with 60 percent. Michigan approved both as part of a package passed with 67 percent. In addition, the Voting Rights Act was overwhelmingly reauthorized in 2006: 98-0 in the Senate and 390-33 in the House. So the GOP’s recent stiffening of opposition seems largely driven by the sense that they’re losing their grip electorally: Trump lost the popular vote by 3 million votes, while McConnell’s Senate majority rests on a deficit of 25 million votes. The reality was quite different: a relatively minor provision, allowing for paid leave (not a vacation) to serve as poll workers and receive necessary training. Anyone who’s ever voted on election day knows that poll workers don’t work for either side on campaigns — indeed campaigning is legally forbidden in and around polling places. Poll workers are a mom-and-apple-pie part of American democracy. The fact that McConnell tried to paint them as sinister conspiracy speaks volumes about the dishonesty of the opposition to HR-1. Because HR-1 is so multifaceted, and the press is so willing to uncritically repeat McConnell’s lies, the Senate may well ignore it, as McConnell has promised. But Democrats have a potential response: passing individual parts as standalone bills, whose popular appeal is much more straightforward. Senate Republicans resisting them all could play an important role in getting rid of their majority in 2020. One key provision that could be singled out this way is Sarbanes’ signature proposal, a voluntary 6-1 match for candidates for federal office. This could profoundly shift the balance of power between large and small donors, said Lee Drutman, author of The Business of America is Lobbying. Small donors fueled Bernie Sanders’ 2016 campaign, which helped advance a whole set of related economic fairness issues — raising the minimum wage, Medicare for All, free public college, etc. This was done without a 6-1 matching fund. Imagine what would be possible with it. That’s what got McConnell really scared. And, he should be.